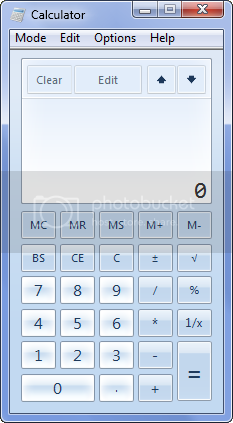 Before Windows 7, the Windows Calculator was an overlooked area of Windows. Used by so many people on a daily basis for minor arithmetic tasks, yet appreciated by so few people. From the looks of it, Microsoft seems to have done a sterling job on their latest Operating System. All the previously-overlooked utilities, including: Wordpad, Calculator, and even Paint, have been completely redone for the new version of Windows. Daily Gyan has posted a port of the Windows 7 calculator for Windows Vista. It works perfectly. It’s not particularly easy to replace system files on Windows. I’ve created a little script that will do this automatically. Follow the steps below. Download the 2 files you need: calc.exe and calc.exe.mui (found under the en-US folder in the download above). Download the script, and place it in the same folder as the 2 files (e.g. your desktop). Boot into safe mode, and double click the script.